The Stock Market is the place where everything, including diamonds are traded. Everyday, you either hear or watch on television about the markets, its ups, downs and side-ways trading. Investors, brokers, and people in general, either work at the stock exchanges or invest their monies in them. The market is generally made up of the NASDAQ (National Association of Securities and Dealers Automated Quotation) on the American Stock Exchange, NYSE (New York Stock Exchange) and is referred as a listed exchange, DJIA (Dow Jones Industrial Average) it is publicly traded, but, privately controlled from 1882 by the Bancroft family until December 31, 2007 when it was acquired by the News Corporation. The S&P 500 Index (Standard & Poor's 500 Index) a free float-weighted index published in 1957 of the prices for 500 common stocks traded in the United States, and other international stock markets located in London, Toronto, Paris Bourse, Tokoyo, Bombay, Hong Kong, and Deutsche Borse. Generally, you can invest your money in the market to make a living, to raise funds for your business, or to make extra money for your personal needs, for instance, to pay bills, travel, to go shopping, etc. You might want to know how to get started in the stock market or how to invest your money. The purpose of the stock market is to raise money for you, your family, friends and business partners. You would invest your money in the market by first finding out what resources you want to invest in. There are companies, commodities, products (funds, bonds, CDs, IRAs, options, futures and many more), that you maybe interested in investing. Diamond futures index as cash tenders are traded in the stock market like commodities, such as, cocoa, sugar, wheat, corn, and the other commodities. Stock Market investing consists of purchasing shares at market quoted prices. When you are ready to invest your money in one of those investment products, you can look in the newspapers in the financial pages, investment newspapers, call a broker or do online investing with an online broker. Many online brokers are discounted and to open an account with them does not cost much. Sometimes, trading stocks online can be more beneficial to you, it doesn't cost much and you can do your own trades. Trading the Diamond Futures Index is the same as trading commodities. Futures are the indices investors trade everyday. The behavior of the market is where the prices go up, down, or side-ways. You will either trade in a bull or bear market. Bull market is when the prices go up and the bear market is when the prices go down. You can trade side-ways in either market. 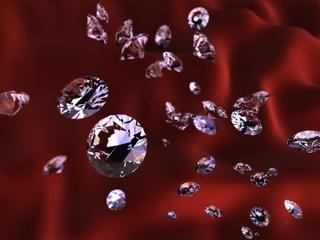 In the Diamond Industry, experts of the World Federation of Diamonds and the International Diamond Manufacturers Assocation and the Rapaport Group unveiled a plan for a completely price-transparent diamond-futures market 2-years ago (June, 2007). There were difficulties in the beginning of establishing this futures market, but, as of January, 2004, you can find diamonds trust traded on the Dow Jones Diamonds. Cash tenders for diamonds includes high-quality round brilliants ranging from 1.01 to 1.19 carats with diamond-grading reports from the Gemological Institute of America and HRD for those interested parties who want to invest in the Diamond Futures Index. In order for you to invest in the Diamond Futures Index, you would go to a broker, who specializes in trading the Diamond Futures Indices. The broker would show you and explain to you the different diamond round brilliants and their carat weights. Then he would tell you the price of this futures contract. In trading diamond futures, you'll need to purchase a futures contract. The Rapaport Group wanted to bring the Diamond Futures Index Contracts to the stock market in early 2009. I haven't seen any updated news about these contracts on the stock market yet. Diamonds Trust are traded on the Dow Jones' New York Stock Exchange. Its symbol is: (NYSE: DIA). You can find out more information on trading diamonds trust on the Dow online, the Wall Street Journal, Investor's Daily and the Financial Times newspapers. To find information on stock brokers who trades diamonds trust for their clients in the telephone directories, online, and in the financial newspapers.